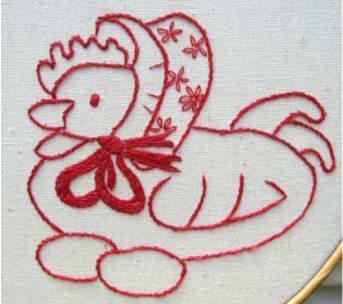 I thought I would start my collection of free redwork embroidery patterns with this cute Mother Hen design. I have included stitching guidelines but of course you are free to do your own thing to create a unique piece of needlework. I drew this design to resemble the style of the original redwork designs. Printed at the size on this page, the design would be ideal made up into a pincushion. 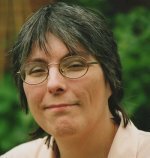 You can take your printout to a copy shop to have it enlarged if you wish to make it into a quilt square. To print the pattern please click here. It will open as a pdf file which you can save onto your computer. If this is your first piece of redwork embroidery you will need to collect some basic supplies together. Of course you will need red thread; I like to use DMC 321 floss but you could also use 498 or 817 if you want something a little darker. White muslin or cotton fabric is suitable for stitching the design on, or if you are in the UK you could use an unbleached calico. An embroidery hoop is optional, but I like to use one. 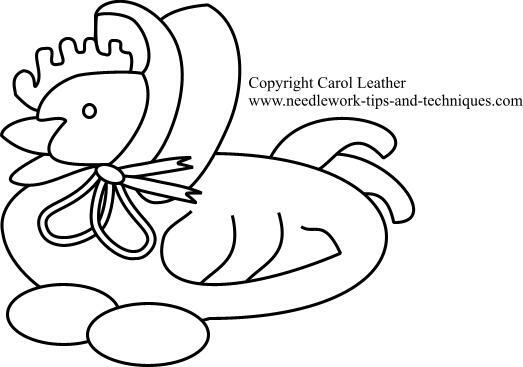 You will need a sized 8-10 sharp pointed embroidery, betweens or crewel needle. To transfer the pattern onto your fabric you can use any of the techniques on my iron on transfer page. An easy way to do this is to tape the pattern and fabric to a window pane and trace around the outlines. If you are lucky enough to have a lightbox then that would be even simpler. 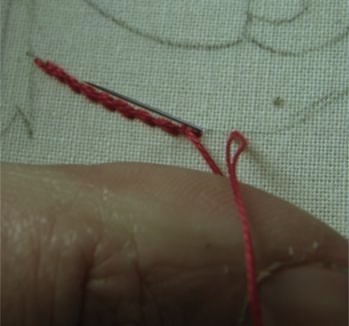 The stitches used in this redwork design are simple; stem stitch (see below), satin stitch and lazy daisy stitch (or detached chain stitch). I used 2 strands of thread for the main outlines and a single strand for the crease lines and the lazy daisy stitches in the hat. 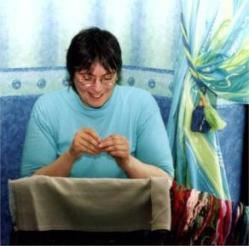 The following two photographs show how to work stem stitch in both the sewing and stab stitch methods. Below them is my video that shows it being worked. If you are working on an embroidery hoop it is difficult to push the needle into the fabric and out again in a single movement. When working on a hoop I like to loop the working thread around my thumb until I have inserted the needle back through the fabric where the last stitch finished, then pull the thread snug to the fabric. Don't pull too tightly or you may pucker the fabric. Stem stitch will produce a line that looks a bit like a rope and this effect can be heightened if you angle each stitch slightly. 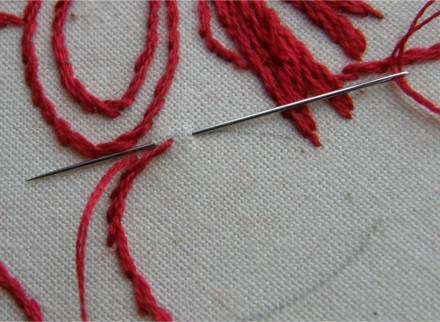 I like to bring the needle up just to one side of the pattern line and then take it down just over the other side. As well as making a slightly wider line it helps to cover up any hint of the pattern drawn on the fabric. Where there is a long sweeping line on the pattern you can use slightly larger stitches, reserving tiny stitches for tight curves or intricate detail. On this design, for example, I used tiny stitches for the hens wattle (that red wobbly bit above her head), sometimes only picking up a few threads of the fabric for each stitch. Some free redwork embroidery patterns will have sections that you can fill in with rows of stem stitch to create some contrast with the outlined areas. I used this idea on the bow under the hen's chin. For the knot I used satin stitch worked over an outline of split stitch. I left a slight gap showing where one of the loops of the bow went behind the other as you can see in the completed photograph. Other areas can be decorated with either french knots or lazy daisy stitches. Either would work to decorate the hen's hat. I hope you have enjoyed this tutorial and will come back to check out the rest of my free redwork embroidery patterns as I add them to the site.